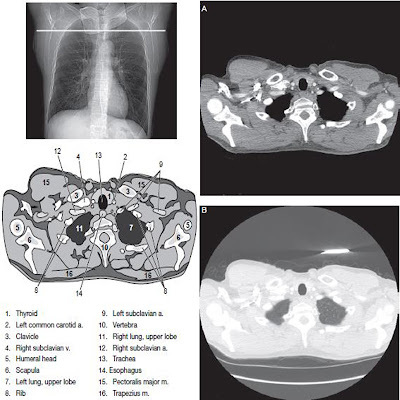 Location and extend of fracture and fragment alignments, joint space abnormalities soft tissue effussions, and location of opaque foreign bodies are demonstrated. Place lead shield over pelvic area to shield gonads. Take radiograph with patient supine or sitting; flex knee, with plantar surface of foot on table; turn body slightly away from side in question. Align and center long axis of foot to CR and to long axis of portion of IR being exposed. Rotate foot medially to place plantar surface 30 degree to 40 degree to plane of IR. The general plane of the dorsum of the foot should be parallel to IR and perpendicular to CR. Use 45 degree radiolucent support block to prevent motion. Use sandbags of necessary to prevent cassette from slipping on tabletop. Collimate to outer margins of skin on four sides. Note: Some references suggest only 30degree oblique routinely. 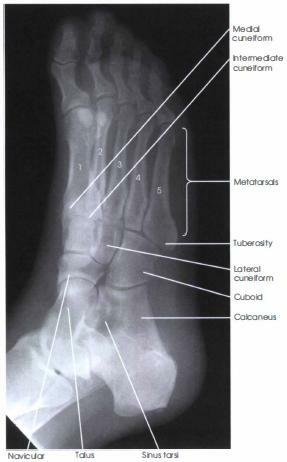 This text recommends greater obliquity, 40 to 50 degrees, to best demonstrate tarsals and proximal matatasals relatively free of superimposition for the foot with an average tranverse arch. Rotate the foot laterally 30 degrees (less oblique required because of the natural arch of the foot). A lateral oblique will best demonstrate the space between first and second metatasals and between first and second cunieforms. The navicular also will be well visualized on the lateral oblique. Entire foot should be demonstrated from distal phalanges to posterior calcanues and proximal talus. Long axis of foot should be aligned to long axis of IR. Correct obliquity is demonstrated when third through fifth matatasals are free of superimposition. First and second matatasals also should be free of superimposition except for base area. Tuberosity at base of fifth matatasal are seen in profile and is well visualized. Joint spaces around cuboid and the sinus tarsi are open and well demonstrated when foot is obliqued correctly. Center of four-sided collimation (CR) should be to base of third metatarsal. Collimation field should include soft tissue surrounding the foot. Optimal density and contrast with no motion should visualized sharp borders and trabecular markings of phalanges, metatarsals, and tarsals.